Oops. I did it again…another birthday dessert. I promise this isn’t a birthday blog! Lately, it just seems like one of my friends has a birthday each week. But another birthday means another excuse for a new dessert. I won’t say no to that! It’s been a couple of weeks since I’ve made a trip to the grocery store, so I had to make do with what I had on hand. 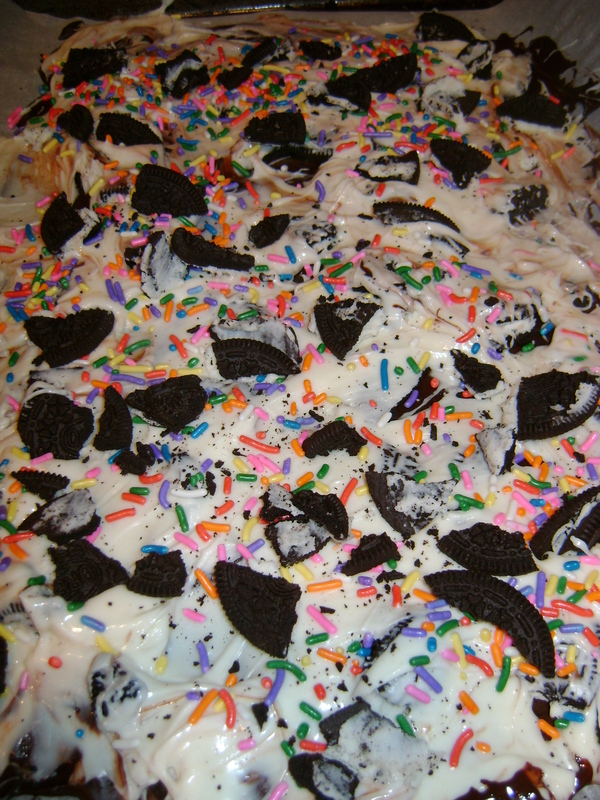 Somehow, I mustered up dark chocolate, white chocolate, oreos, cake mix and rainbow sprinkles. It did the trick! 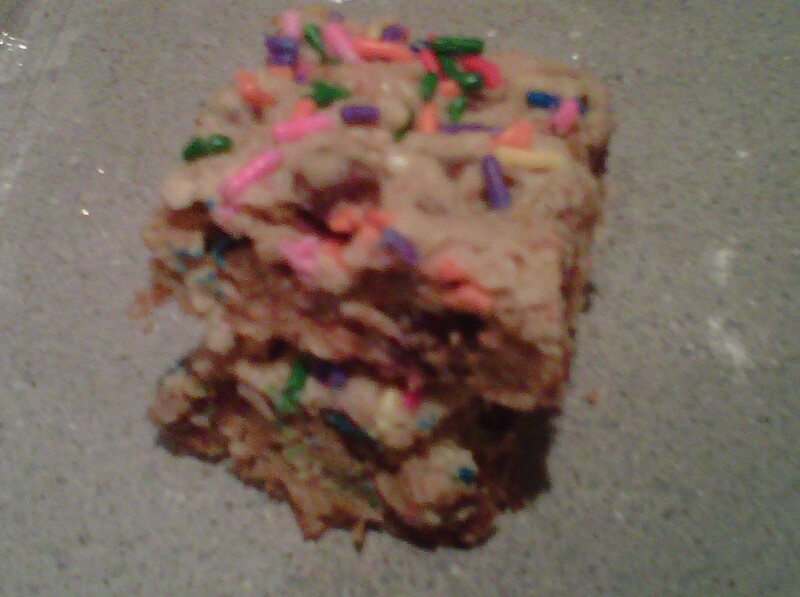 Within 30 minutes, I whipped up a new favorite “bark” dessert This is a spin off of the cake batter bark I made a few weeks ago, and it’s even more decadent. What do you get when you add two layers of oreos, and double the cake mix? 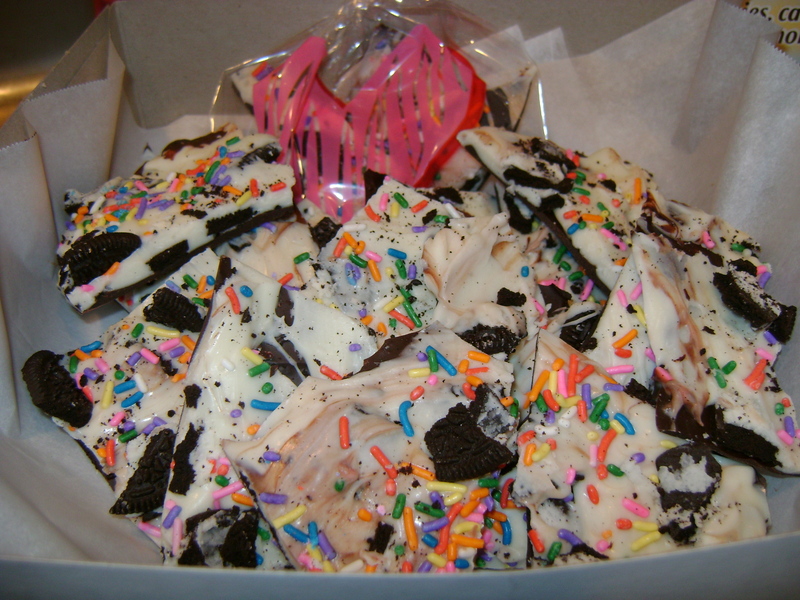 DOUBLE COOKIES ’N CREAM CAKE BATTER BARK. Good thing I had a ribbon on hand…I had to tie the package shut to stop snacking. Get this stuff out of my apartment…it’s addicting! 1)Crush Oreos and set aside. 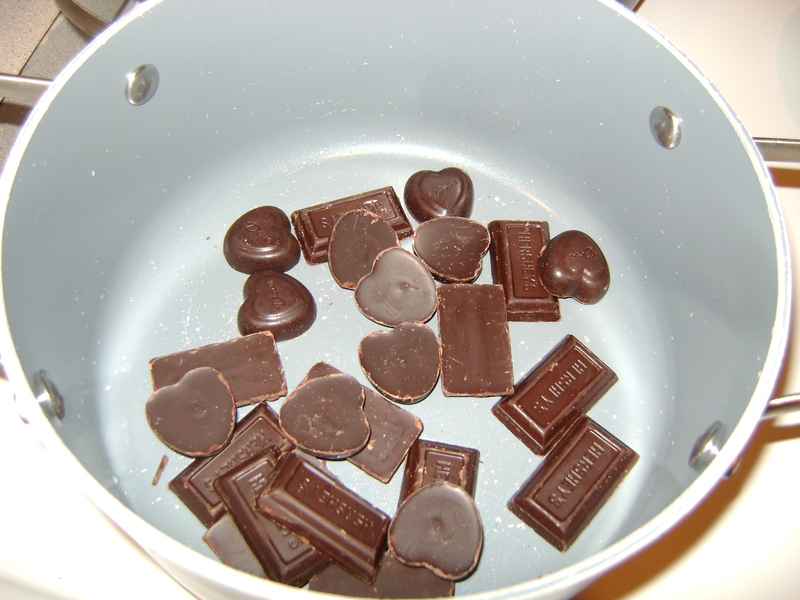 Melt dark chocolate either in the microwave or a use a double boiler on the stove. 2)Line a baking sheet with parchment paper and pour the chocolate on it. 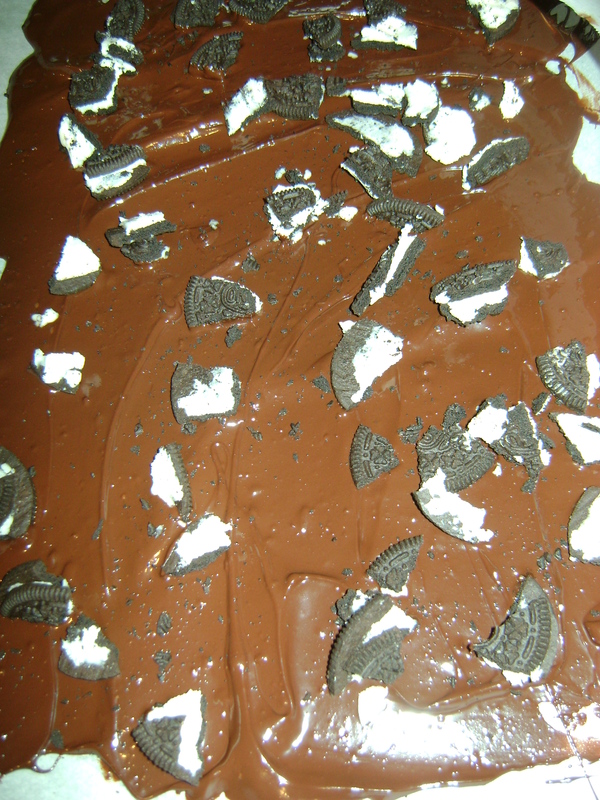 Sprinkle crushed oreos over the chocolate layer. Smooth with a spatula. Stick in the freezer for 15 minutes. 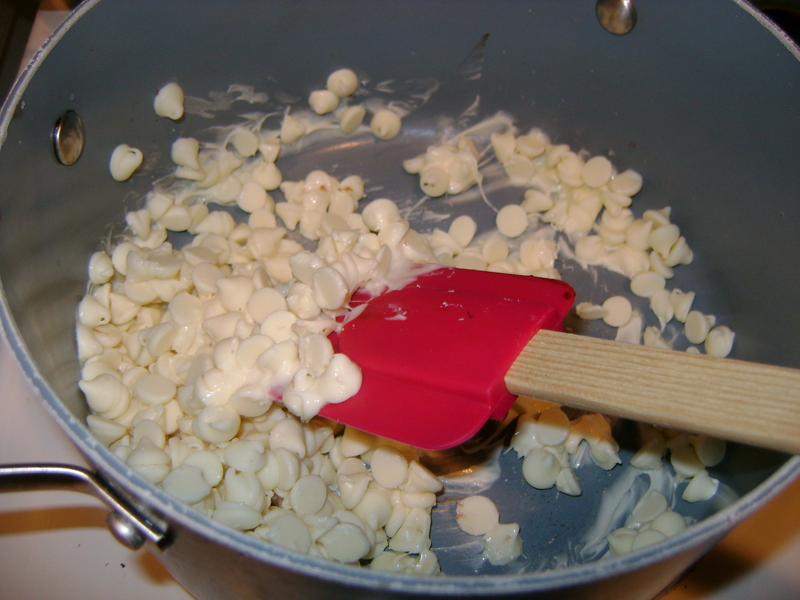 4) Remove baking sheet with chocolate from the freezer and immediately pour the white chocolate on top. 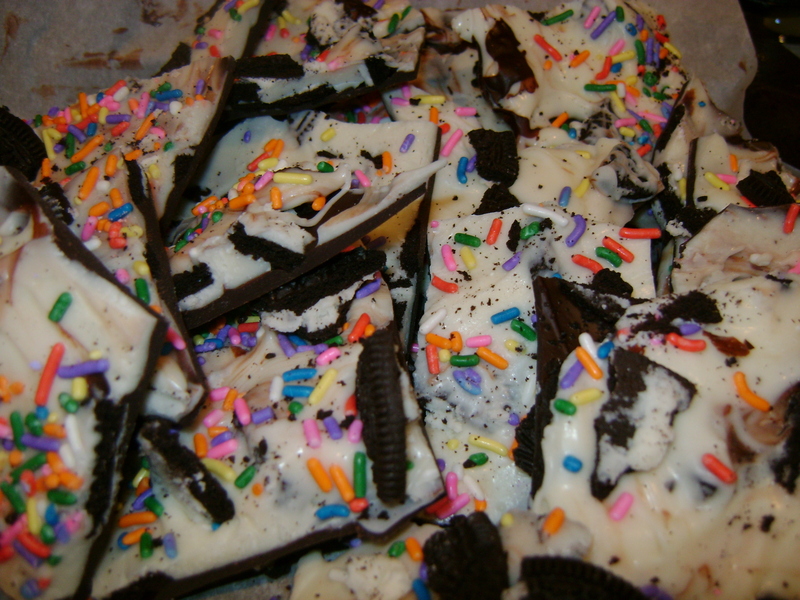 Sprinkle on remaining oreos, and then the sprinkles. Freeze for another 15-20 minutes. 5) Once set, break into chunks. Keep refrigerated, and if these are a gift, consider taping the container shut. The best part about making this dessert (besides the end result of course), is the minimal cleanup. I used 1 bowl, 1 spatula, and a cookie sheet. The cookie sheet wasn’t even dirty. Parchment paper is a blessing! Popcorn is one of my favorite snacks. Unfortunately…or maybe fortunately…it can be incredibly healthy or extremely indulgent. Lucky for me, I stumbled across a popcorn recipe that was both indulgent AND healthy. Here’s the thing, my sweet tooth becomes a raging problem around 9 p.m. every night. While I typically reach for frozen yogurt or ice-cream to fulfill my cravings, I‘ve been so cold lately that I‘ve been reaching for warm cookies or candy instead. Not the best alternative, especially so late at night. In an effort to eat a healthy late-night snack, I’ve been eating warm buttered popcorn. Delicious, however it doesn’t exactly fulfill my sweet tooth. Salty, yes. Sweet, no. (Those darn Pretzel m&m’s, they sparked a sweet and salty love inside of me!) This recipe fit the bill: sweet, salty, crunchy, delicious. Plus, it made a big enough batch to last for a few nights, and was just as tasty three days later! 1. Pop popcorn. 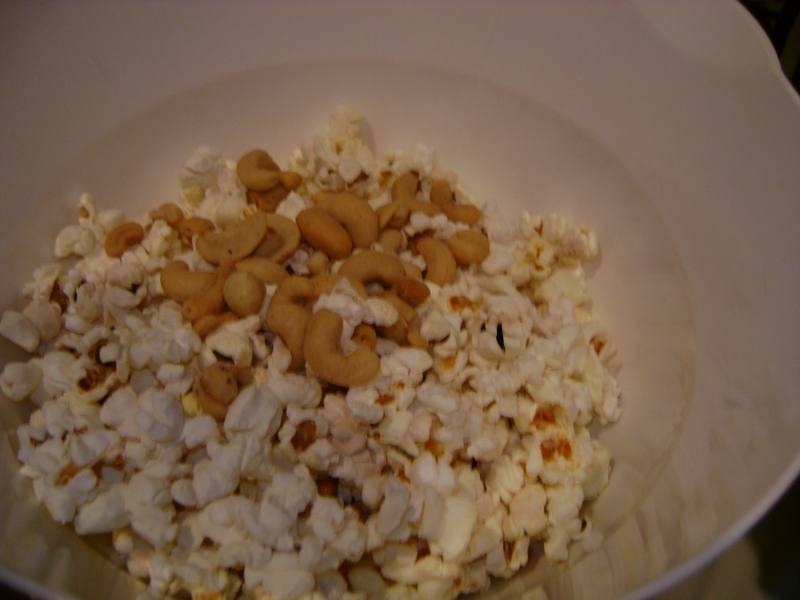 Once popped, pour in large mixing bowl and stir in cashews. 2. 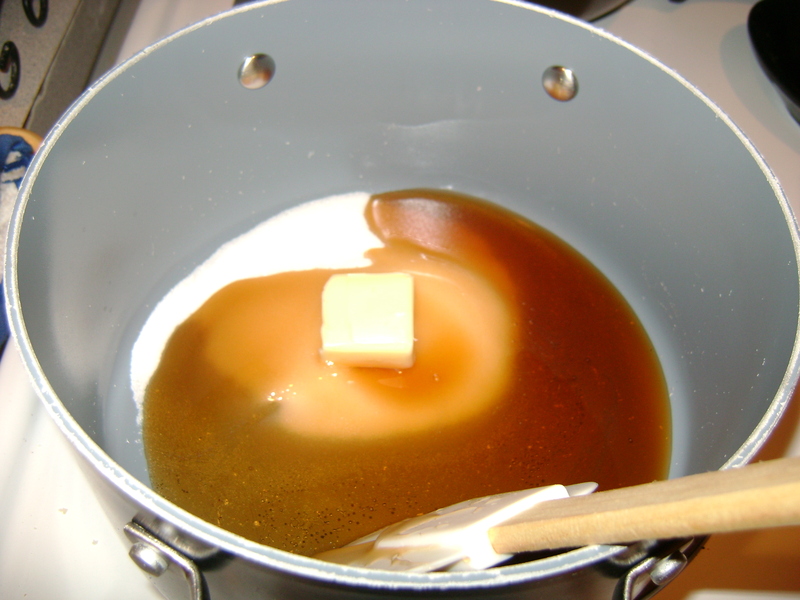 Combine sugar and remaining ingredients in a small saucepan; bring to a boil. Cook 1 minute, stirring constantly. Remove from heat; cool 1 minute. 3. 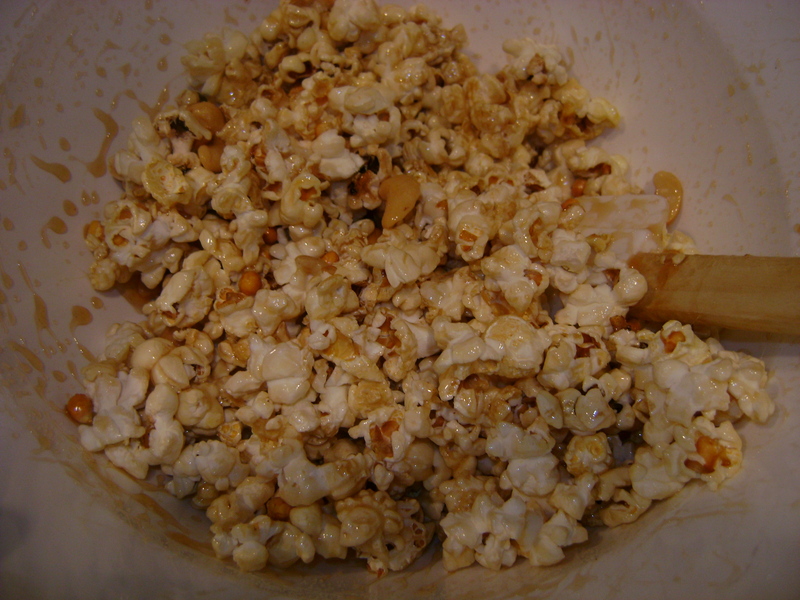 Pour hot syrup mixture over popcorn mixture; toss well to coat. 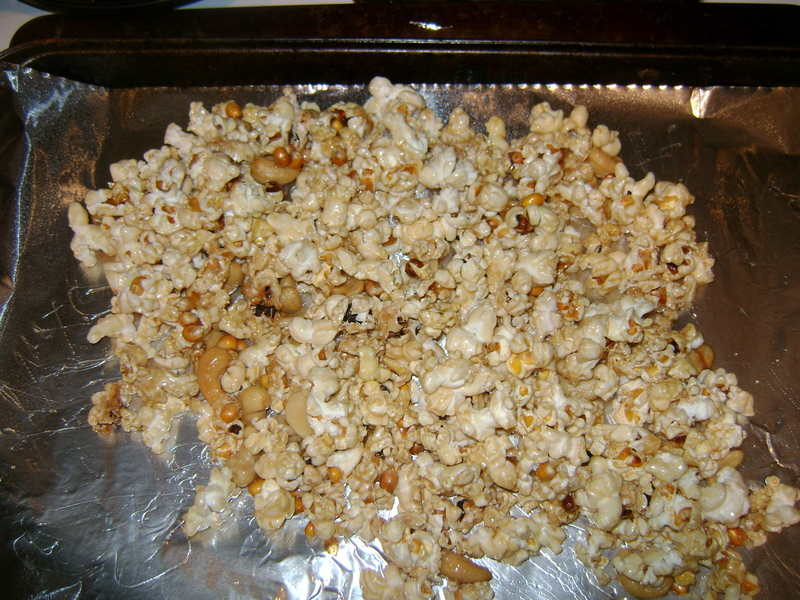 Immediately spread popcorn mixture out onto prepared jelly-roll pan. Cool 3 minutes. 4. 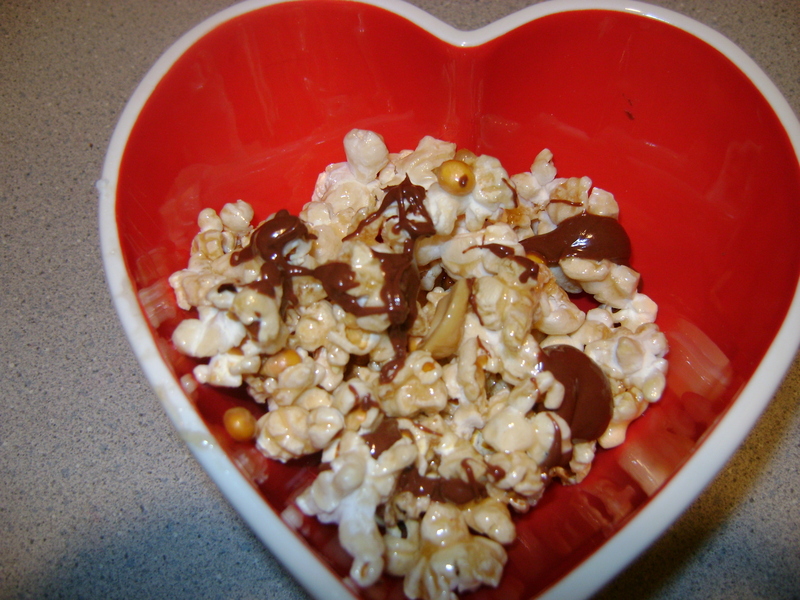 Melt chocolate chips in microwave, drizzle over your serving of popcorn! The original recipe called for ground red pepper to make this a spicy snack, but I preferred to leave it sweet. Next time, I’m going to use candied pecans. The possibilities with this recipe are endless. Take note, you will need paper towels on hand–this is a sticky treat, but a delicious one, to boot! 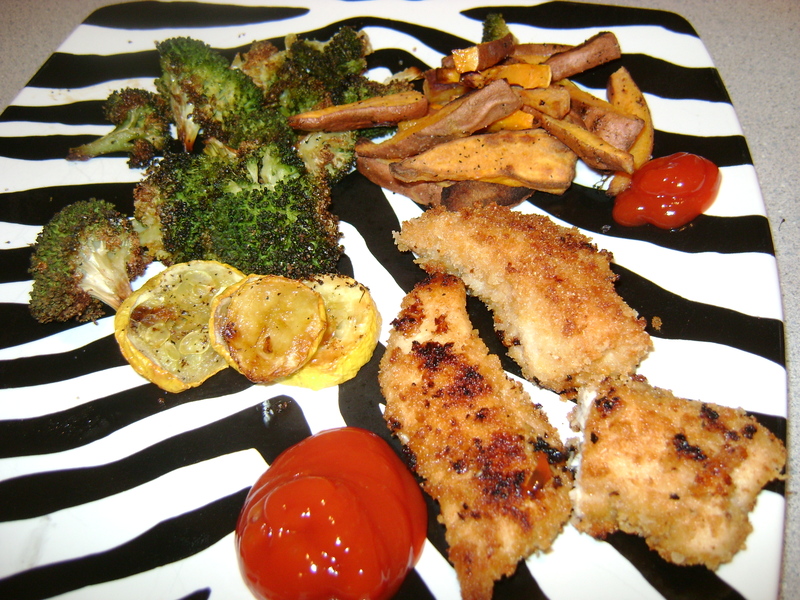 Crispy chicken fingers, crunchy French fries…heart attack on a plate?! While typically unhealthy fare, it doesn’t have to be, and it can still be delicious. Growing up, fast food was a rare occurrence in my household. I never understood why my Mom didn’t want us eating these types of foods on a daily, weekly, or even a monthly basis until I started to care about nutrition and whole foods. When I was younger, this led to over-ordering and extreme excitement whenever I walked into (or drove through) Wendy’s or another popular fast food chain. Why get a small fry when you can super-size for only .50 cents more? But something occurred over and over again: I always loved eating the food, but I hated how I felt afterward. I’d have a stomachache, indigestion, heartburn, the list goes on! About mid-way through college, I stopped eating fried foods (except for the occasional sweet potato fries-can’t help it!) because of these feelings. However, I really missed my chicken fingers. When I stumbled across this recipe from cooking light, I knew I wanted to recreate it, while putting a spin of my own on it too. 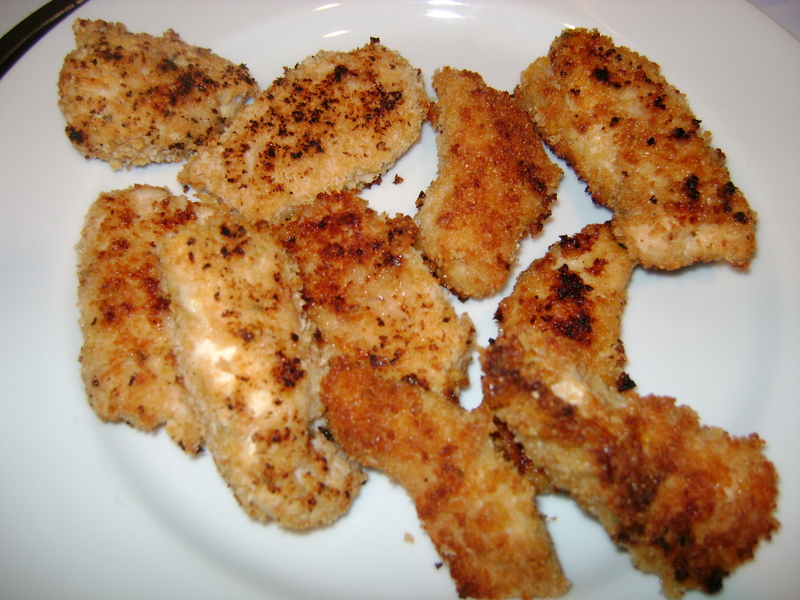 Quaker Honey O’s cereal seemed like the perfect addition to add an extra “crunch” to this chicken. Don’t believe me? It’s so crunchy, I refuse to eat it at work, in fear that my co-workers will hear me chomping away! I was right…it added an extra crunch and a hint of honey that blended well with the spices and additional panko mixture. This has become a weekly staple in my cook book. It’s a great dinner dish, but also spruces up salads and sandwiches, too. You won’t think it’s healthy…it’s that good! 2. Combine first 3 ingredients in a shallow dish; Wisk and place egg whites in a bowl. 3. 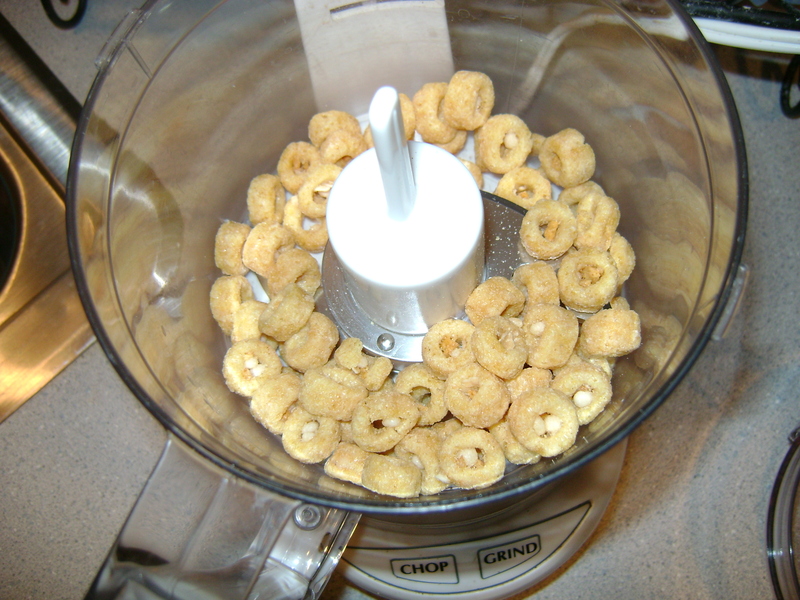 Blend honey O’s in a food processor until fairly smooth. 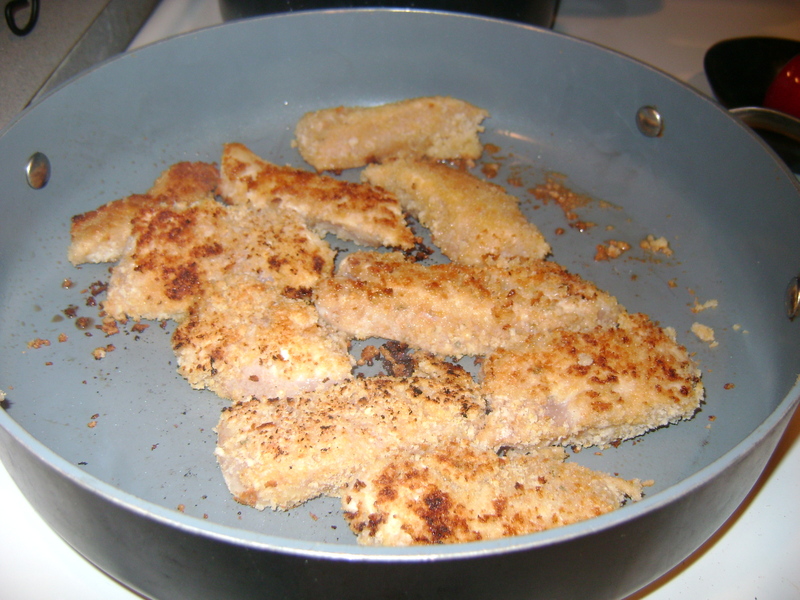 Place with panko in a shallow dish. 4. Dredge 1 breast half in flour mixture. Dip in egg whites; dredge in panko/cereal mixture. 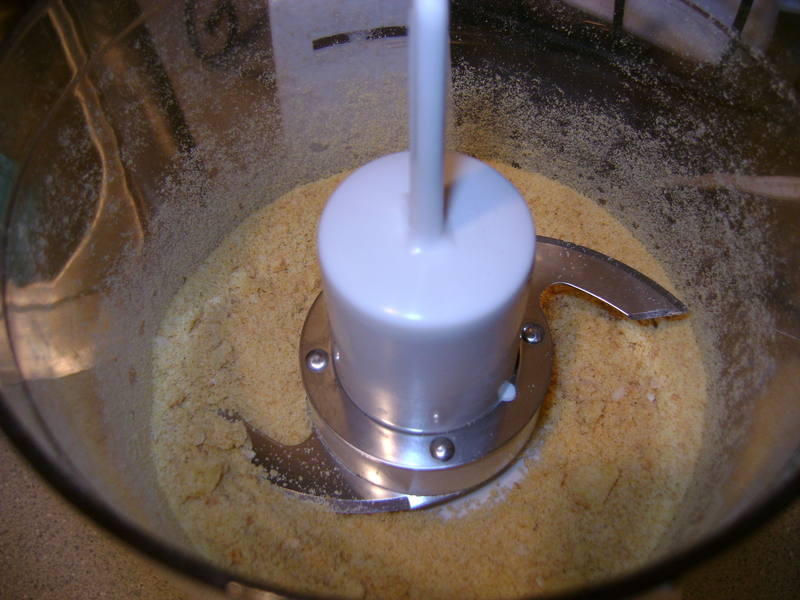 Repeat procedure with remaining chicken, flour mixture, egg whites, and panko/cereal mixture. 5. Coat large ovenproof skillet with cooking spray. Heat ½ tablespoon oil in pan as well over medium-high heat. Add chicken to pan; cook 2 minutes. Add remaining ½ tablespoon oil. Turn chicken over; cook 2 minutes. Coat chicken with cooking spray; place pan in oven. Bake at 450° for 5 minutes. 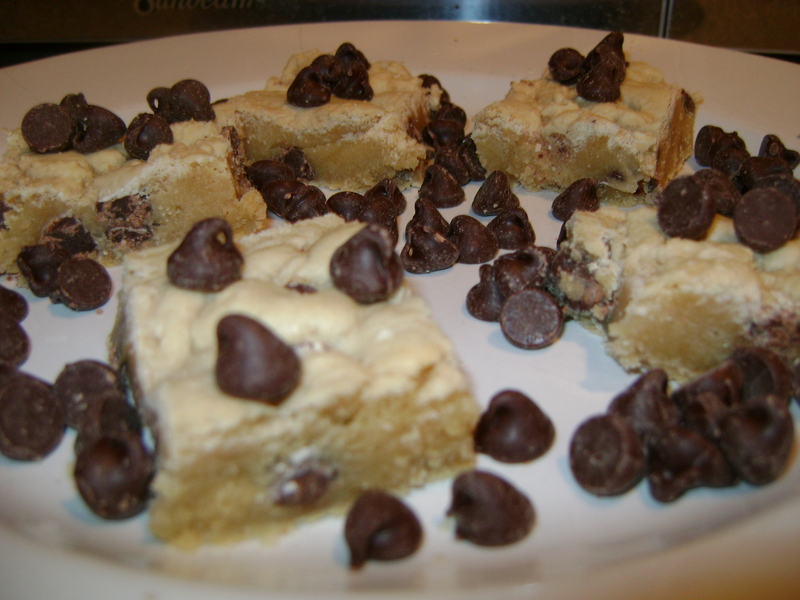 any ordinary cookie bars. 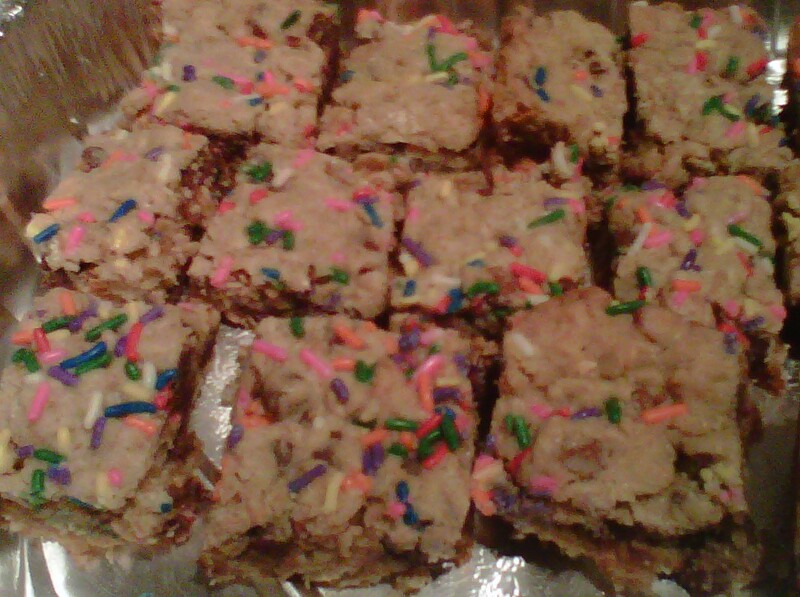 These are Cinna-Chocolate Chip Oatmeal Cookie bars. 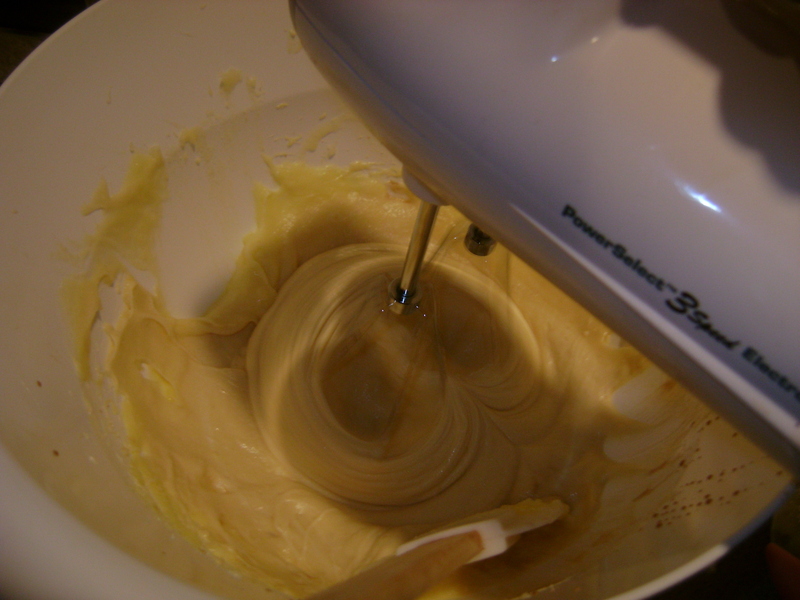 2) In large bowl, beat butter and sugars with electric mixer until creamy. 3)Add egg and vanilla; beat well. 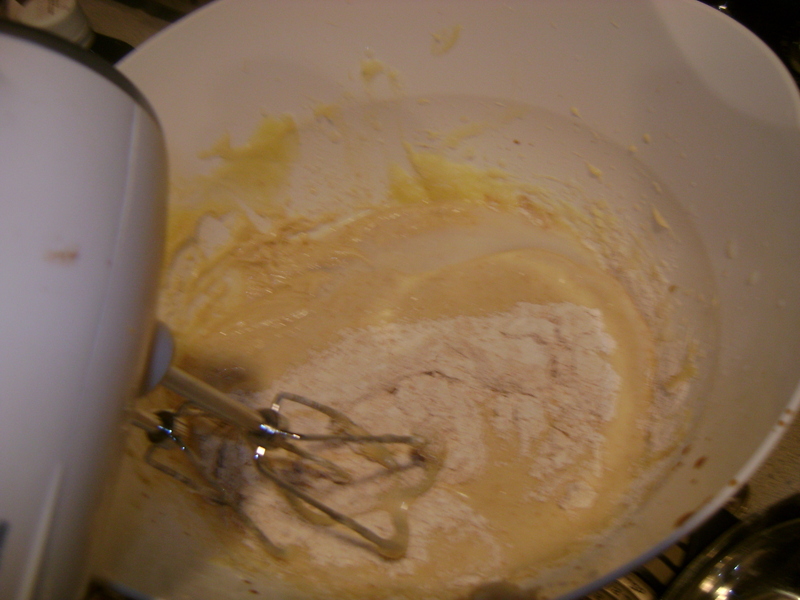 4) Add combined flour, baking soda and salt; mix well. 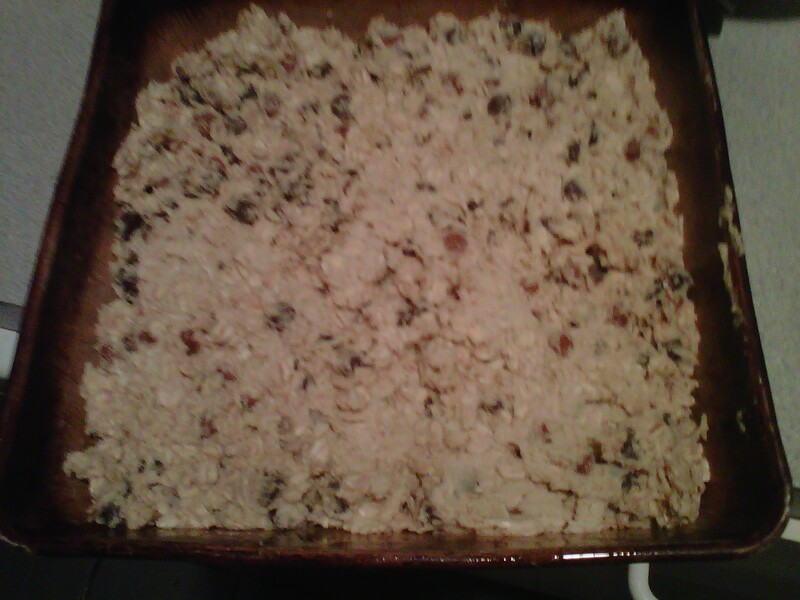 5) Stir in oats, cinnamon chips, and chocolate chips; mix well. 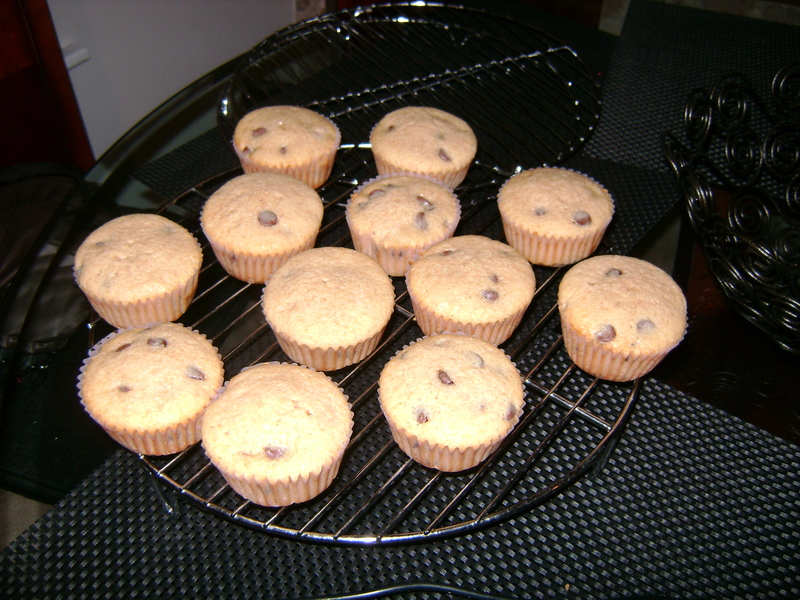 7) Bake 18-20 minutes or until top is lightly browned. Cool about 10 minutes. Optional: Serve with ice cream. recipes, these are a healthier version of a decadent treat. two saved for me :) the rest for the birthday girl! I have a cookie dough addiction. Along with my cookie addiction, cake batter addiction…do you see a pattern? There are worse addictions out there…so I’m okay with it, and when a birthday rolls around…I succumb to my addictions. Since one of my co-workers celebrated her 25th today (the last major birthday until 30 in my opinion!) , I figured she needed some killer cupcakes to celebrate. 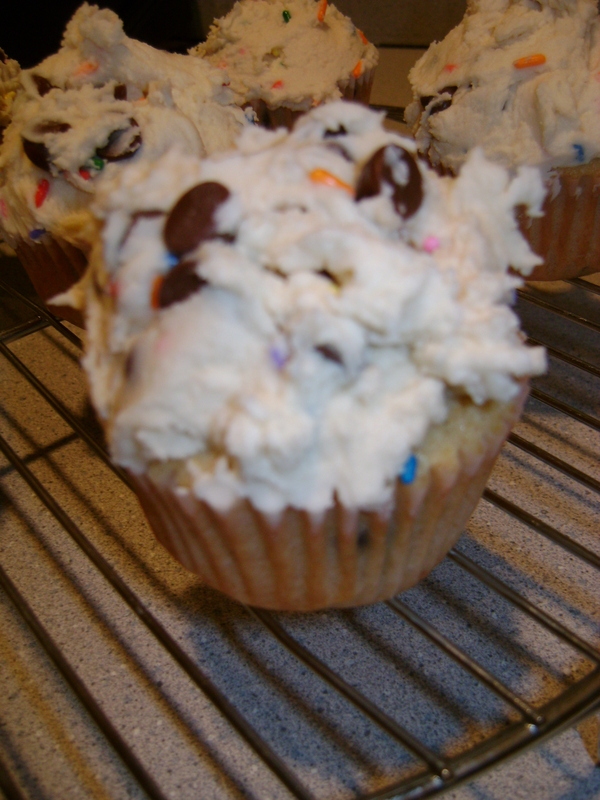 What’s better than chocolate chip cookie dough cupcakes with cookie dough frosting? I can’t think of much! These are surprisingly simple to put together, and truthfully taste 100 times better than boxed cupcakes. 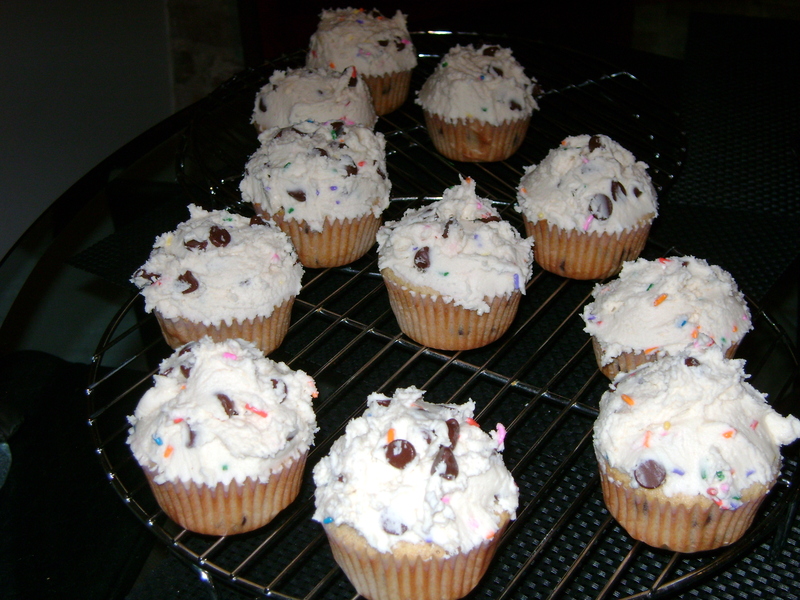 Seriously, I love my Funfetti, but these put them to shame! 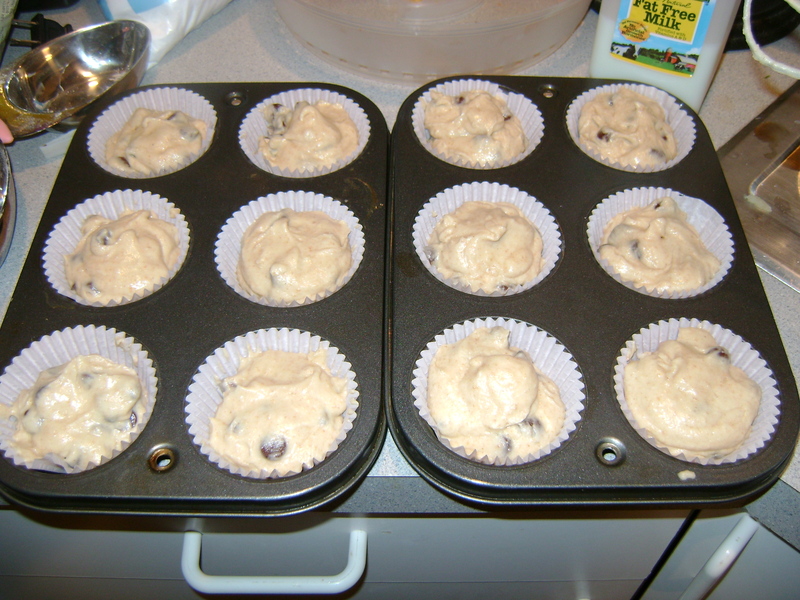 Plus, I used part whole-wheat flour and skim milk, so they’re healthier, too. 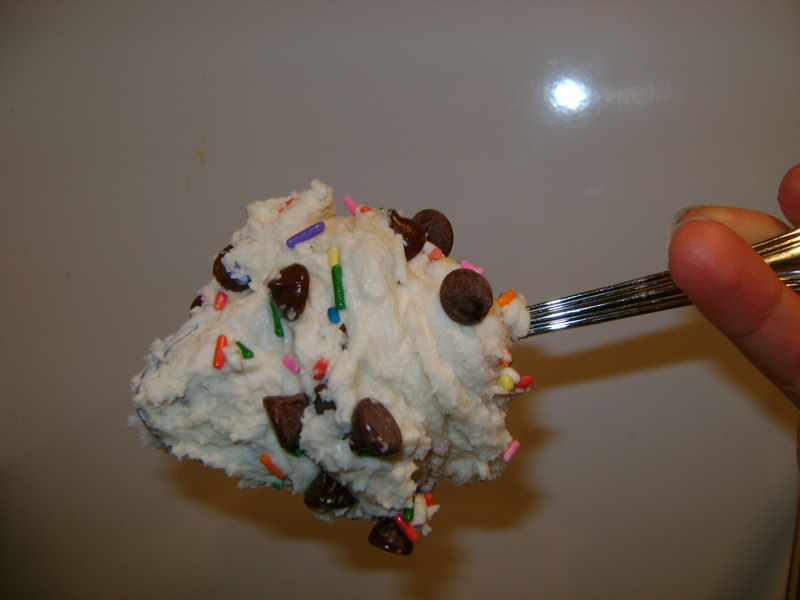 All you really need is a hand mixer, two medium-sized mixing bowls, and a spatula (for scraping and licking of course). The ingredient list is pretty short, the dough is darn tasty, and don’t even get me started on the frosting…thick, creamy, sugary, perfection…with a birthday sprinkle twist. I’ve been in a sugar coma since making it last night, but since I licked the bowl clean, I deserved it! Make these and you’ll be in the same coma…it’s a great one, I promise! 2) Cream butter, sugar, and eggs together until fluffy. Add vanilla. 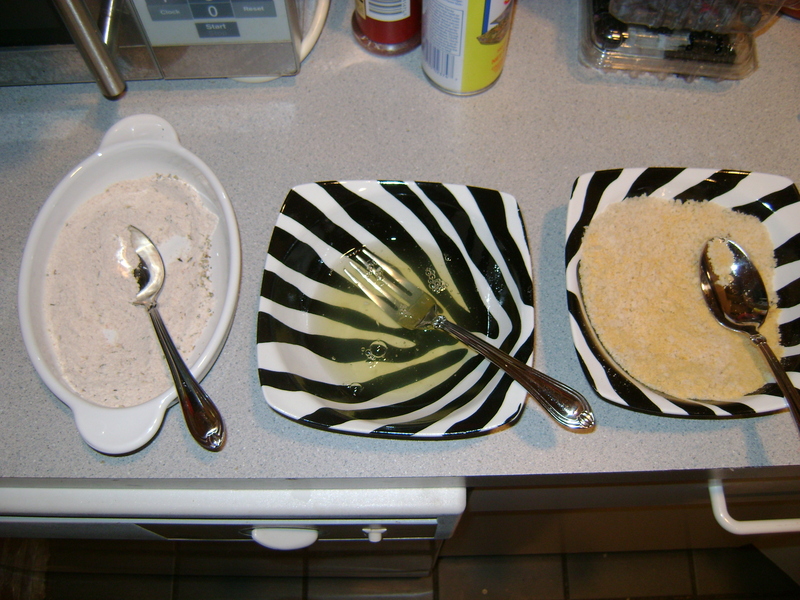 3) Combine dry ingredients in a bowl. Add half of the dry ingredients, mixing until just combined. Add the milk. 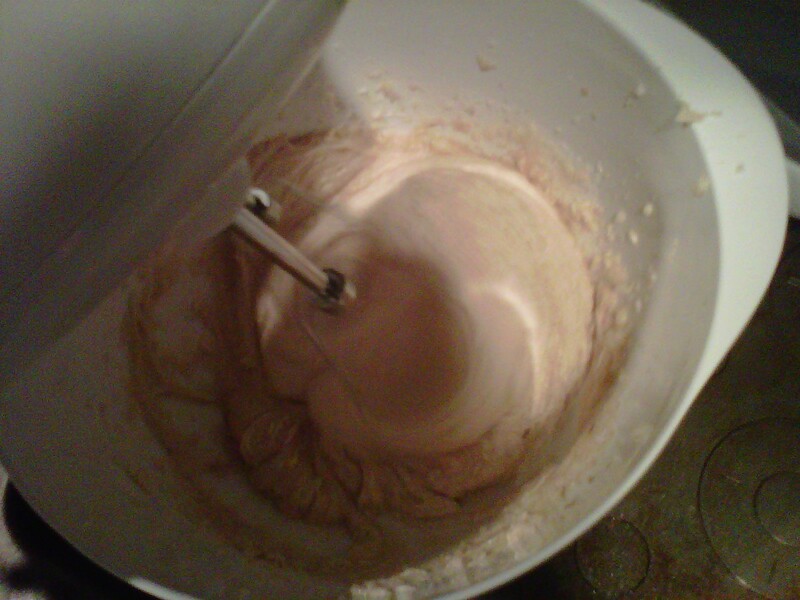 4) Once mixed, add remaining dry ingredients. Bake for 18-22 minutes at 350. Let cool, then frost. I had hoped the birthday girl liked cookie dough, I took a guess, and thank goodness she did. She ate one for breakfast! A few comments from my co-workers included “Best cupcake I’ve ever had” and “ I’ll be visiting your bakery”. A bona fide success! I’m off to eat the last one and remain in my sugar coma! Jealous? What’s your favorite cupcake recipe? It’s only fair that I reveal this recipe. After all, its put most of my friends and family into a cookie coma at one point or another. I’m going to claim that it’s my Mom’s fault, since it’s her recipe! Of all of the desserts she makes, this one is the most simple, and most likely will sound pretty average to you: Chocolate Chip Cookie Bars. But allow me warn you…it’s not average. I’ve had this memorized since I started to bake. 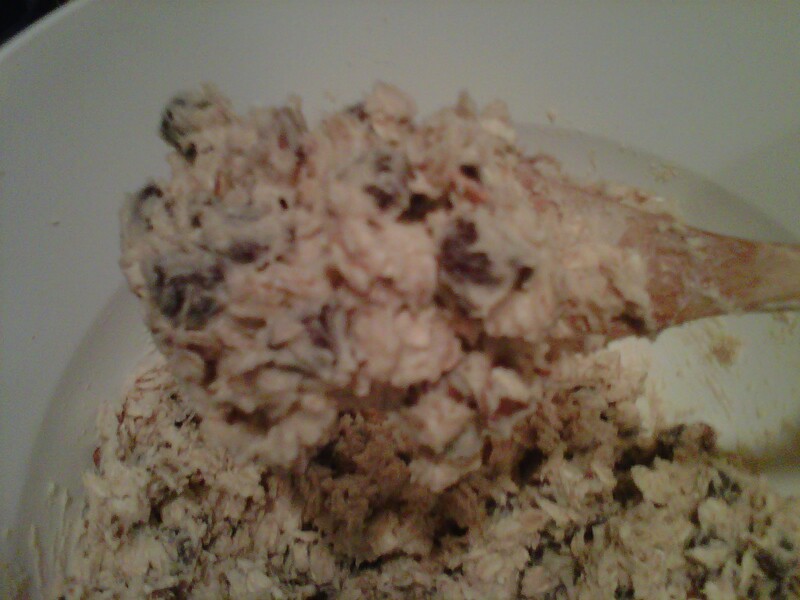 It’s that good, and once you make these, you may never go back to pre-made cookie dough….you won’t want to! On a countless number of occasions, I’ve eaten so much dough that I haven’t been able to fill the baking pan…major oops. I bake these at least once a week, mostly because I never get sick of them, and I typically have the ingredients on hand at all times. These are my go-to dessert for office parties, cookie swaps, and get-togethers with friends. Just make sure you keep one for yourself…they seem to disappear VERY quickly. A guaranteed hit for any occasion. Enjoy! 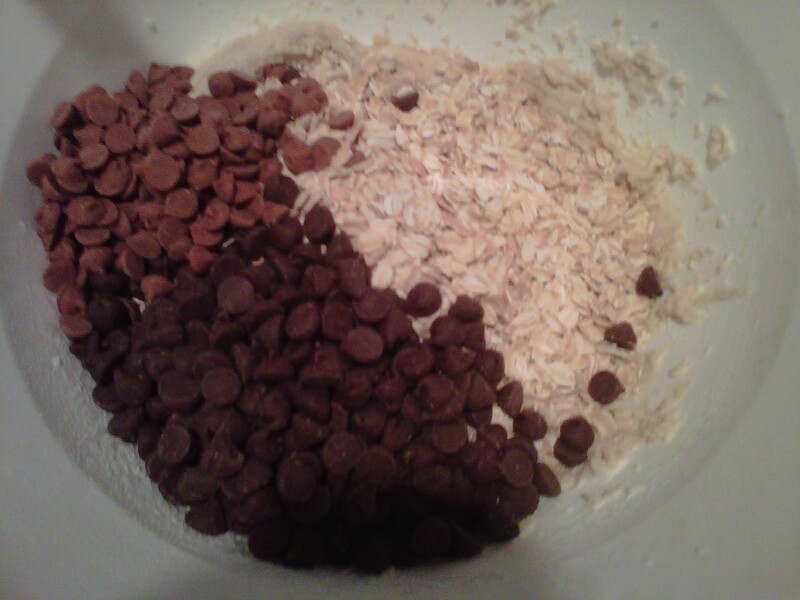 6) Once mixed, add chocolate chips. Looking for a way to spruce up your salads or put a new spin on veggies? You’ve found it. Move over, roasted vegetables. There’s a new queen in town. Say hello to our honey maple roasted friends. Originally from Cooking Light, I modified it slightly and used what I had on hand, plus added some light maple syrup for a little extra sweetness (I couldn’t help it, it’s my ever-present sweet tooth talking). This recipe is ever-so simple and ever-so yummy. The only thing you have to have patience for is chopping the vegetables. Chop, Mix, Bake, Eat. It’s as simple as that. 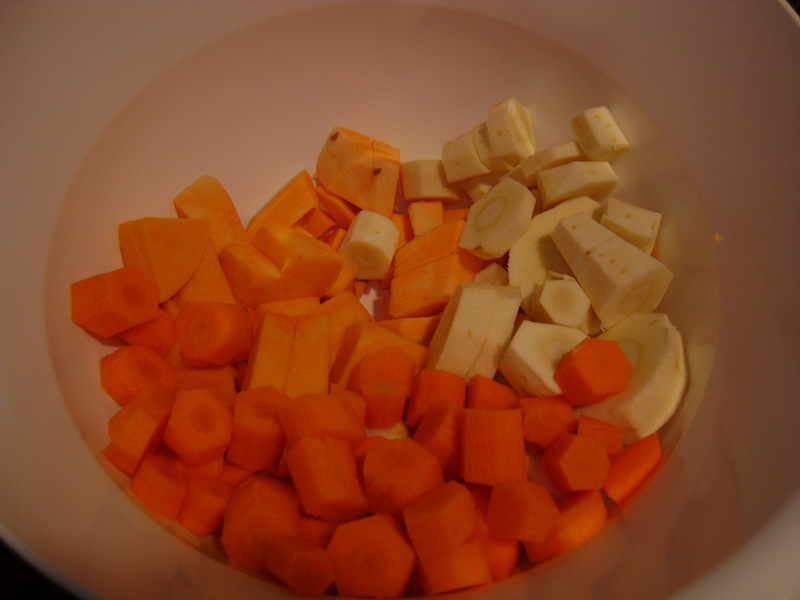 1 1/2 cups coarsely chopped parsnip (about 2 medium) —I used more! Combine all ingredients except the cooking spray in a large bowl; toss to coat. 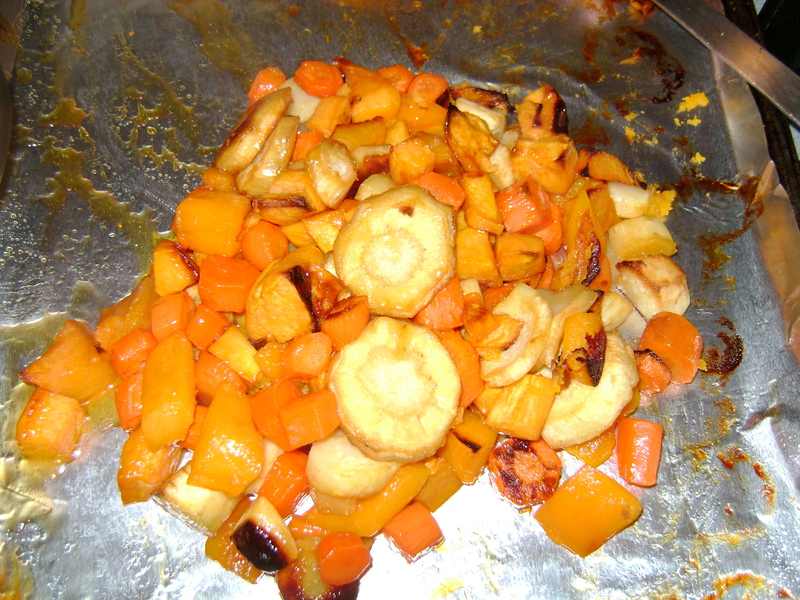 Place vegetable mixture on a jelly-roll pan coated with tinfoil and cooking spray. 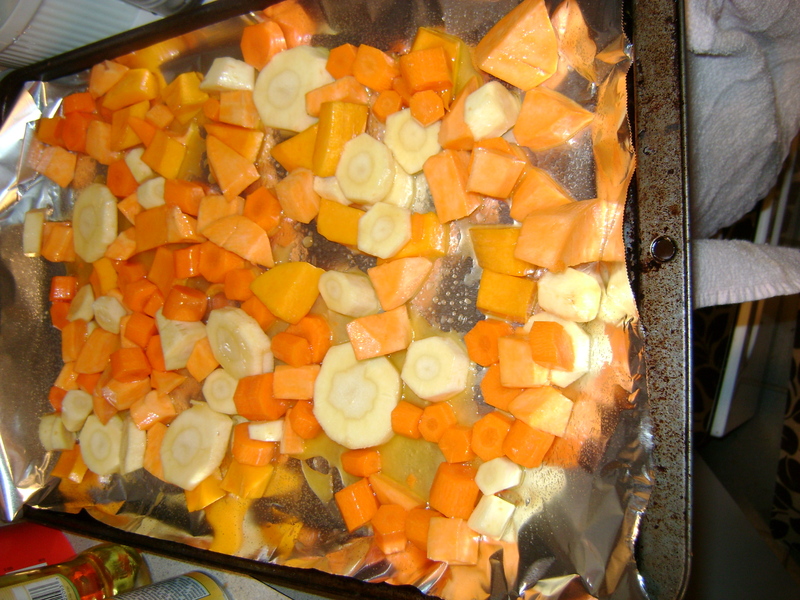 Bake at 450° for 35 minutes or until vegetables are tender and begin to brown, stirring every 15 minutes.